Good question - and many answers exist, but it is Canon's professional line (though used extensively by non-professionals) of EOS EF autofocus 35mm SLR and DSLR still camera lenses. Some say L stands for "Low Dispersion" - achieved by the UD lens elements found in these lenses. But, the true answer is probably the one in Canon's Lens Work III Book - "L" is for "Luxury". Watch the sidelines at the next professional sporting event you attend or watch on TV. Look for the identifying L-lens red stripe around the end of the photographers' camera lenses. These are the people who make a living with their equipment - and they frequently trust the CanonL Lens Series for their income. The above picture shows the Canon EF 70-200mm f/2.8L IS USM Lens (left) compared to the Canon EF 100-400mm f/4.5-5.6L IS USM Lens extended and retracted along with their lens hoods. Both lenses have Wimberley P20 Lens Plates mounted on their tripod rings. Canon L lenses generally come with a lens hood included. The image quality of the Canon L lenses is generally as good as it gets. Contrast, sharpness, color, bokeh (background/foreground blur quality), flare, CA (Chromatic Aberration) ... All are excellent. Full Frame camera body owners will especially find L series lenses to be (on average) significantly sharper toward the edges of the frame compared to lesser lenses. In general, Canon L series lenses focus fast. The wide maximum apertures (smallest number) and fast, quiet USM motors (Ultrasonic Motors) enhance focusing speed. The Canon 85mm f/1.2L USM Lens and the Canon EF 180mm f/3.5L USM Macro Lens are two exceptions to this rule. Many in the Canon L lens series are white in color. According to Canon, this reduces heat gain when a lens is used in bright, direct sunlight. White reflects more light than black - thus, less heat gain. The white lenses look great (my opinion of course), but attract attention. Again - watch for them the next time you watch a sports event on TV or in person. 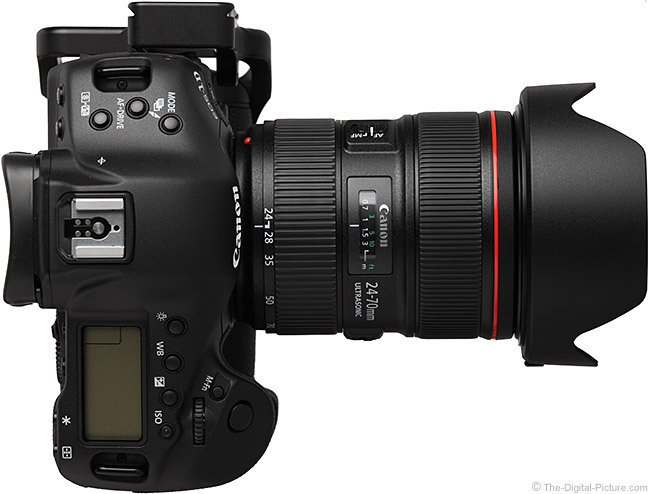 Full time manual focusing (FTM) is another feature typically present in the Canon L lenses. You can let the camera autofocus, then manually adjust focus yourself prior to the shot - without lifting your finger from the shutter. Many of the Canon L series lenses share a 77mm filter size. Because of this, sharing filters such as the B+W Circular Polarizer is possible with many of the lenses in this lineup. More space in the bag and money savings result. Canon L lenses typically have a non-rotating front element. This is important when using certain filters. When coupled with the right camera body (generally Canon's 1-Series bodies), many lenses in the Canon L Series provide water resistance. 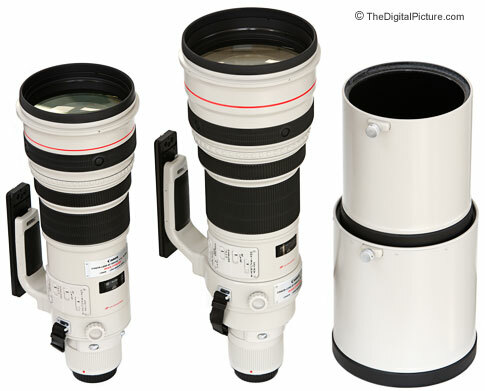 Two of Canon's largest L Lens Series lenses are shown above - The Canon EF 500mm f/4L IS USM Lens (on left) and the Canon EF 600mm f/4L IS USM Lens. Many of the L series lenses with a maximum focal length of 135mm or higher are compatible with the Canon Extender EF 1.4x II and Canon Extender EF 2.0x II. The extenders make a relatively inexpensive way to extend the focal length of a lens. The unfortunate attribute that most of these lenses share is a high price tag. For good (to a seller) or bad (to a buyer), resale value is generally high also. Aren't they beautiful?! 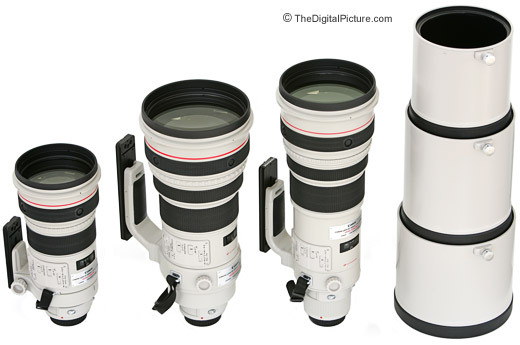 Pictured above from left to right is the Canon EF 300mm f/2.8 ISL USM Lens, Canon EF 400mm f/2.8 ISL USM Lens and Canon EF 500mm f/4 ISL USM Lens. Stacked on the right side from top down are the lens hoods from the 300, 500 and 400. All lenses are pictured with optional Wimberley Lens Plates. The Canon Lens Reviews go into much more detail about specific Canon L lenses. I hope you find the information helpful! Did you know that Canon sells white L Series touchup paint? Although it is not cheap ($14.41 for 100g plus $8.00 or so for shipping), you can order it through Canon Parts. The part number for the older (pre 2010) grey-white color is CY9-8078-001. The phone number to order in the US is 1-732-521-7230. Update: The touch-up paint is now classified as a hazardous material and is not allowed to be shipped in the USA.